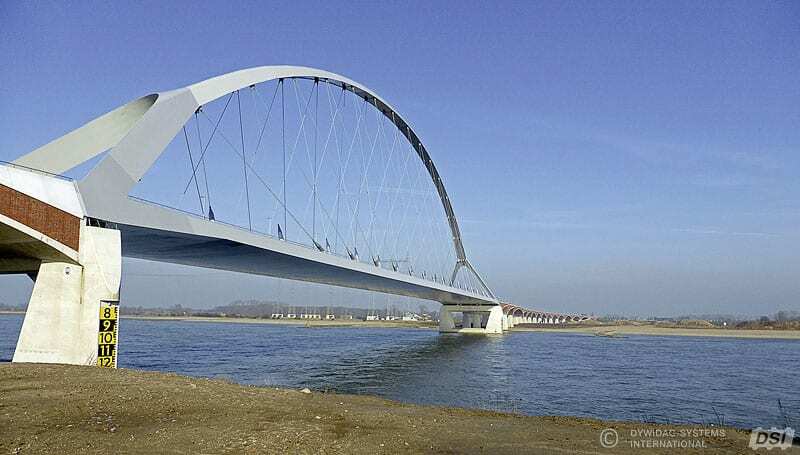 Heavy traffic in the city of Nijmegen made it necessary to construct an alternative route to cross the river Waal, De Oversteek bridge is a part of a new city by-pass. Bridge was able to satisfy city request of five lane crossing with a two lane-cycle path at the east side of the bridge and a 1.0 m wide inspection lane at the west side of the bridge. The main bridge over the river which is a tied-arch bridge spans 285 m fits perfectly within the scenery. The design life of 100 years and minimum cost of maintenance was achieved by state-of-the-art techniques. With its amazing and unique aesthetic looks, the approach structure is one of the longest integral bridge in the world. The City Bridge is built at a historical location “De Oversteek” (which means “The Crossing”), where American soldiers crossed the river to secure the existing Waal bridge, dated from 1936, which was biggest arch bridge in Europe (244 m) at the time of completion, during the operation Market Garden. The bridge has a total length of 1,400 m. The southern approach bridge lays in a curvature with radius of 500m. The Arch Span crosses the river Waal in a straight line, while the northern approach bridge is in horizontal curvature of 2,000m. The approach bridges consist of series of of concrete arches each spanning 42.5m. With a varying arch thickness of 1.5m at supports and 0.5m at midspan, the arch is a prefect example of advanced structural engineering. The arches are filled with foam concrete to reduce the weight surface was covered with mixed aggregates and asphalt layers. The main span with a length of 285 m consists of a single tied arch structure. The composite roadway deck is suspended from the arch by inclined stay cables. The bridge rests on bearings at the two main river piers. A moveable expansion joint is foreseen between the single tied arch and the northern approach bridge. In the tender design, the design team searched together with the architect for the best way to integrate the bridge in the landscape. Since the design life time of the bridge is 100 years, of which the contractor has a maintenance contract for the first 25 years, it is important to think about the maintenance costs. Due to the length of the northern approach bridge which is located over the river foreland and therefore is often flooded, the idea came up to design a bridge without bearings and expansion joints, to save maintenance costs. 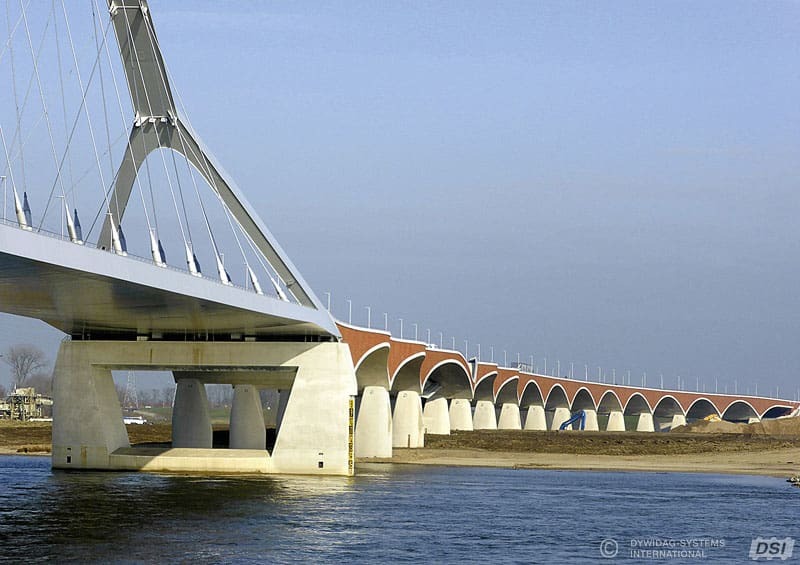 The shape of the single spans using an arch structure, allows the bridge to breath up and down due to thermal actions, as the whole structure is locked up between the abutment Oosterhoutsedijk and the main river pier. The total continuous length of the approach bridge at the north side equals 703 m, including the abutment at the Oosterhoutsedijk. The length at the south side equals 275 m. The concrete arches of the northern and southern approach bridges are rigidly connected to the bridge columns and have no expansion joints. The approach bridges were modelled in Scia Engineer using a 2D beam model for the preliminary and final design stages. Geometrical non-linear calculations were carried out with the 2D beam model. With this model the buckling shapes of the arches were investigated and the second order moments were calculated. To keep the bridge stable during the construction stages, a prestressed tensioning system of bars and beams, spanning between two arch crests, was set in place to take over the thrust force from the arch, which came into action as the falsework was removed. A second 2D beam model was set up to determine the force distribution during the various construction stages. With the 3D model the internal force distribution was determined in order to design the required reinforcement. Moreover, the pile design has been carried out using the results of the 3D model. To obstruct the river as less as possible, all the bridge columns and two main piers were lined up parallel to the river axis. The cross section of the columns are shaped as rain drops and measure 2.0 x 6.0 m, are there for hydraulically well shaped, and no floating debris can pile-up in front of them. Each arch is supported by four columns, spaced 21m in the transverse direction of the bridge and 42.5 m in longitudinal direction. 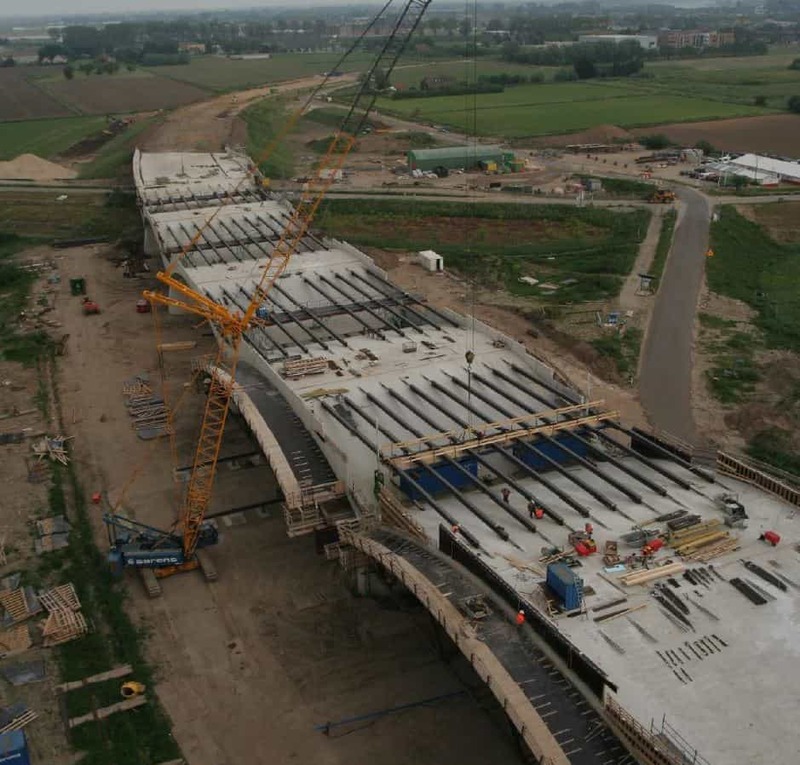 The northern approach bridge consists of 15 arch spans and a half arch at the Oosterhoutsedijk which is connected to a longitudinally prestressed deck monolithically connected to its abutment walls. Since the load of the arch is transferred to the columns, the concrete deck in transverse direction between the columns is set under tension. To meet the requirements of durability and crack width, the bridge is transversely prestressed using bonding prestressed tendons DSI 27 x 15.7 mm dia. strands – Y 1860. The anchoring points of the tendons are recessed into the concrete structure and covered with grout. The joint of the arch with the bridge columns is heavily reinforced, since the deck is nearly 1.5 m thick and it was challenging to fit it together with the prestressed tendons at this location. All intermediate columns are supported by concrete base slabs which are founded on in-situ concrete piles. The base slab at the main piers measure 14.0 x 40.0 x 3.0 m and is founded on 27 bored piles. 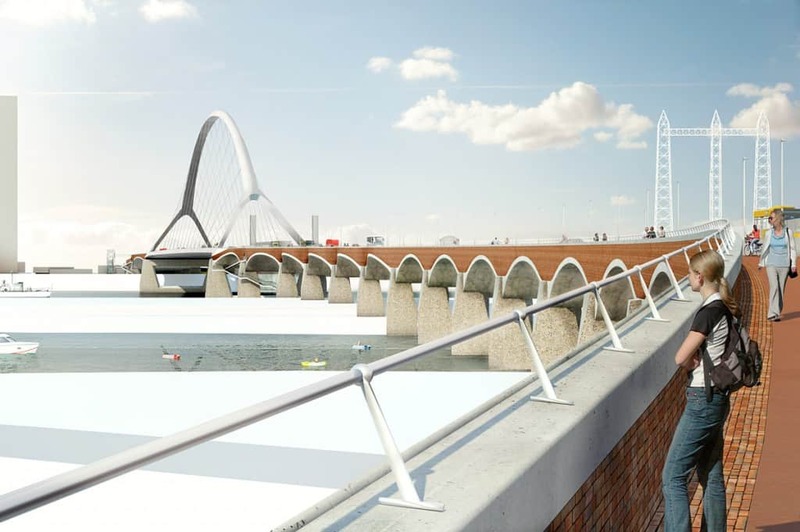 Due to the heavy thrust from the arches, which enter the main river pier at 20 m height, the pile slab has an offset of 3.0 m from the pier axis, to provide the required counter stability. The main pier consists of two major columns connected at the base and the top by a beam. The tied arch will be supported by the top beam, resting on two main bearings and a centre bearing to transfer the transverse loads from the main span. At the northern main pier, the sliding bearings in longitudinal direction are foreseen, thus a modular expansion joint at this pier is required. explosion under the by-pass at the abutment. To design the bridge on this accidental loading, it is shown that the robustness of the bridge is well proven and the risk of a progressive collapse during the life time is limited to a minimum. During the erection of the bridge, special measurements have been applied to prevent progressive collapse. The durability is covered and secured by the right concrete mixture in relation to the normative environmental classes. The quality of the concrete cover ensures the required lifetime of 100 years. The concrete cover on the columns surface requires a higher value, because the surface will be roughened after completion of the columns because of architectural design matters. All anchors that will be drilled in the concrete surfaces are made of stainless steel. The pile caps and the columns are made using a steel form work. The spans between the columns are poured in two phases. The first phase was the erection of the hammerhead spanning the two columns in transverse direction. This was also in advantage to install and prestress the tendon cables, before the deck sections where connected. The construction of the arches between the hammerheads was carried out on a supporting truss arched falsework structure, covering an area of more than 1,000 m2 for each span. The falsework consisted of three single sections with a span of 40 m, weighing 100 tons each. The three sections where mounted on the ground to one big unit, weighing 300 tons, and then hoisted by a jack system from the hammerheads into position. Steel columns placed between the falsework arches and the pile caps supported the falsework. Each deck was cast as one concrete unit with a quantity of nearly 650 m3 in quality C35/45. To keep the bridge stable during the construction stages, three of those falsework sets where needed. As soon as two arches where cast and the concrete hardened, a prestressed tensioning system of bars and beams, spanning between two arch crests, was set in place to take over the thrust force from the arch, which came into action as the falsework was removed. Each span required ten of those beam structures.